First of all: A lot of things happen in this book. Second of all: Not much really happens in this book. 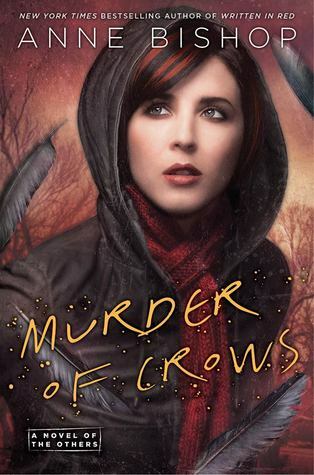 Let me clarify: Much like the first book in this series, Murder of Crows is extremely enjoyable to me. But I feel like that is entirely a personal response to some sort of endearing charm bestowed upon this book, the series, and the characters, in general. Because, to be totally honest, while there DOES seem to be a distinctive main conflict in Murder of Crows, the book itself spends a lot of its time wandering from one subplot to another anecdote to another random banal, everyday occurrence. Okay. So it's really hard to explain, but somehow, all put together, the book makes sense to me, even though there were definitely certain side tangents that made absolutely no sense. And I'm still not entirely sure why they were incorporated. But somehow, everything manages to tie together into a pretty satisfying book that kept me entertained. In spite of the very elementary way in which the narration and dialogue is presented, there are a lot of very serious, thought-provoking subjects brought up as well. I like the idea that the Others and the humans are having such a hard time getting along because neither side is willing to communicate properly with each other. There's pride in the way, and there's mistrust. And I like that in the small Lakeside Courtyard, the few humans able to penetrate the trust of the Others have kind of figured this out and hope to build bridges in forwarding the effort for everyone to live in harmony. This was a pretty big ideal emphasized in the book. But the way it was presented felt so juvenile that it was hard to take seriously. As were all the other conflicts going on. We get to see more of Thaisia, including being introduced to a new set of humans that are, like the cassandra sangue, not normal--they are called Intuits, and they have the ability to "get a feeling" when something is about to happen. And whenever and Intuit "has a feeling" about something, they are always taken seriously. It's not exactly prophecy, but it's like a step above normal humans with no paranormal abilities. And because of this, we get to see (or rather we're told via back story) that these humans were persecuted by the "normal" humans. The world suddenly adds a few more layers than simply savage Others versus civilized humans. Because now we get a nice look at the fact that life isn't as simple as that. Anyway, as I'd stated before in my thoughts on the first book, there's just something strangely attractive about this series that draws me in. I mean, there's less focus on the main story line and more focus on Meg's and Simon's quest to learn more about each other's respective races, as well as themselves. 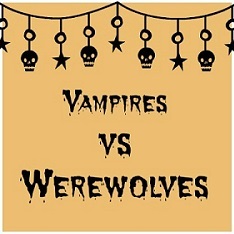 Both are going through their own forms of growth and development, which in turn makes this book feel like a young adult or middle grade, contemporary, coming-of-age chick lit piece... that just so happens to take place in a dark, twisted world of evil humans and man-eating shifters and the idea of "benevolent ownership" of another human being. It's twisted and sweet in it's own way. Again, more layers to the world. I like all the characters, though it's hard to keep track of them. I like the whole ideal behind this alternate reality's creation and the present day world. I love the character interactions. And even some of the conflicts brought up have a lot of potential to expand upon. But the book is just written in such a juvenile manner that I'm sure many people would have a problem with it. Aside from that, the book is also 80% "The Day in the Life of Our Meg" with some other newsworthy happenings going on every few scenes (written in a slightly "Breaking News" type format). This, I'm sure, could get boring for many people... unless you're like me and have already fallen in love with the entire ordeal before you realize that nothing has actually happened in this series save Meg winning over the entire Courtyard of Others by being a sweet childish Mary Sue... and being really good at sorting mail. Oh yes. And there's a lot of bloodshed and apparently a war brewing in the background. Or something like that.